Discover the world’s best 100 EVOOs and all there is to know about extra virgin olive oils! Prefaced by the most influential chef in the world, José Andrés, the app of the EVOOLEUM World’s Top 100 Extra Virgin Olive Oils Guide introduces the exclusive TOP 100 EVOOs, or in other words, the best 100 extra virgin olive oils in the world, according to the results obtained in the International EVOOLEUM Awards for Quality in Extra Virgin Olive Oil, organized by Mercacei and AEMO. A competition that, in addition to standing out for its absolute rigor and reliability, it boasts having the most spectacular jury, or tasting panel, that currently exists, and possibly the best group of international tasters never before gathered. The application -for smartphones or tablets, available for free for iOS and Android in Spanish and English- also allows you to search by country, score obtained in the contest, category (best monovarietal, blend, green fruity and mature fruity, organic production, packaging design) … or discover the exclusive TOP10 of the ten best EVOOs in the world according to the results of the EVOOLEUM Awards competition. What EVOO should a grilled fish be cooked? Would an arbequino or a hojiblanco go better with my tomato and avocado salad? 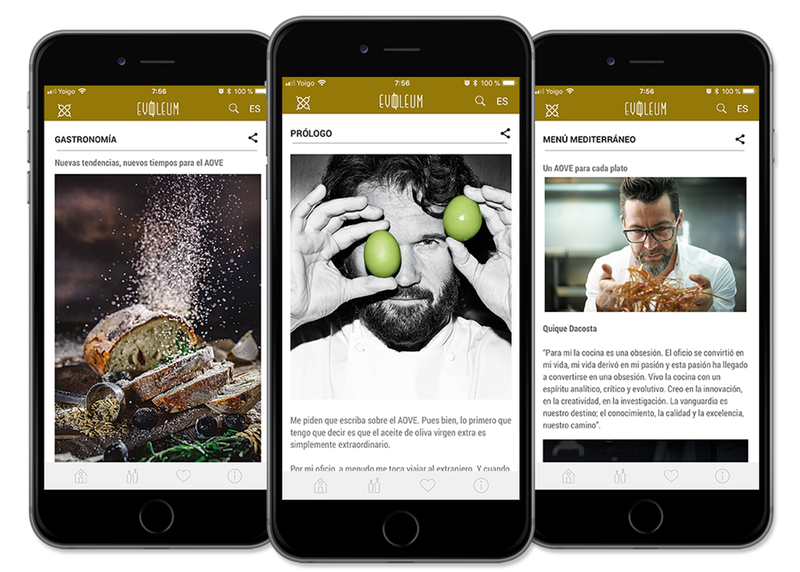 The answers are in the app of EVOOLEUM, because each juice of the TOP100 goes accompanied of the best foodpairing. And all with a modern and intuitive design that stands out for its navigability and easy of use, allowing to locate quickly and without cumbersome shortcuts the section of our interest, without forgetting other powerful exclusive contents related to the fascinating world of extra virgin olive oil and its culture: gastronomy, the art of tasting, international olive growing, the analysis of the evolution of the world production of olive oil, the best EVOO stores, oleotourism, EVOO and health, olive oil dictionary … everything to soak up the wonderful culture of the extra virgin olive oil. An exciting journey at your fingertips.